Taken in the Farne Islands in Northumberland, it is my favourite location to photograph puffins. Yes, it is a busy location over the summer months but when you find your own little space and seek out your own compositions your then in your own little world and nothing else around you matters. Your well looked after by the boat operator Billy Shiels, and have got to know the skipper and owners very well over the years, it’s like catching up with old friends. It is very sad to think that this colourful and characteristic little bird could become a rarer sight due to the lack of it’s favourite food, the sandeel. 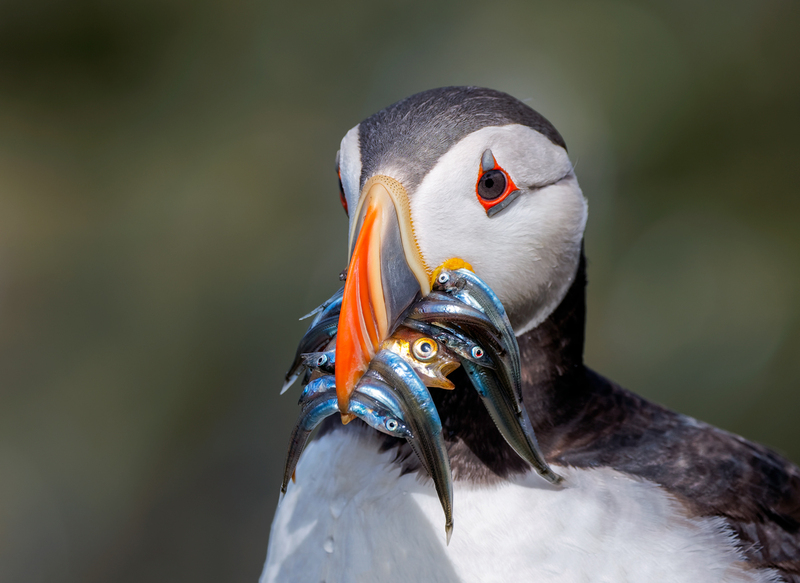 Which demonstrated in this picture was not a problem for this little puffin, although it also has a single golden coloured fish which I am not familiar with but I do not really know my fish unless it’s cooked in batter and served with chips! 🙂 Which I have to say Lewis’s has the best fish supper in Seahouses! Which always goes down a treat after a long day out photographing.